Preta (Sanskrit: प्रेत, Standard Tibetan: ཡི་དྭགས་ yi dags) also known as hungry ghost, is the Sanskrit name for a type of supernatural being described in Hinduism, Buddhism, Taoism, and Chinese and Vietnamese folk religion as undergoing suffering greater than that of humans, particularly an extreme level of hunger and thirst. They have their origins in Indian religions and have been adopted into East Asian religions via the spread of Buddhism. Preta is often translated into English as "hungry ghost" from the Chinese adaptation. In early sources such as the Petavatthu, they are much more varied. The descriptions below apply mainly in this narrower context. A Burmese depiction of hungry ghosts (pyetta). Pretas are believed to have been false, corrupted, compulsive, deceitful, jealous or greedy people in a previous life. As a result of their karma, they are afflicted with an insatiable hunger for a particular substance or object. Traditionally, this is something repugnant or humiliating, such as cadavers or feces, though in more recent stories, it can be anything, however bizarre. Through the belief and influence of Hinduism and Buddhism in much of Asia, preta figure prominently in the cultures of India, Sri Lanka, China, Japan, Korea, Vietnam, Tibet, Thailand, Cambodia, Laos and Myanmar. The Sanskrit term preta means "departed, deceased, a dead person", from pra-ita, literally "gone forth, departed". In Classical Sanskrit, the term refers to the spirit of any dead person, but especially before the obsequial rites are performed, but also more narrowly to a ghost or evil being. The Sanskrit term was taken up in Buddhism to describe one of six possible states of rebirth. The Chinese term egui (餓鬼), literally "starving ghost", is thus not a literal translation of the Sanskrit term. Pretas are invisible to the human eye, but some believe they can be discerned by humans in certain mental states. They are described as human-like, but with sunken, mummified skin, narrow limbs, enormously distended bellies and long, thin necks. This appearance is a metaphor for their mental situation: they have enormous appetites, signified by their gigantic bellies, but a very limited ability to satisfy those appetites, symbolized by their slender necks. Pretas are often depicted in Japanese art (particularly that from the Heian period) as emaciated human beings with bulging stomachs and inhumanly small mouths and throats. They are frequently shown licking up spilled water in temples or accompanied by demons representing their personal agony. Otherwise they may be shown as balls of smoke or fire. Pretas dwell in the waste and desert places of the earth, and vary in situation according to their past karma. Some of them can eat a little, but find it very difficult to find food or drink. Others can find food and drink, but find it very difficult to swallow. Others find that the food they eat seems to burst into flames as they swallow it. Others see something edible or drinkable and desire it but it withers or dries up before their eyes. As a result, they are always hungry. In addition to hunger, pretas suffer from immoderate heat and cold; they find that even the moon scorches them in the summer, while the sun freezes them in the winter. The sufferings of the pretas often resemble those of the dwellers in hell, and the two types of being are easily confused. The simplest distinction is that beings in hell are confined to their subterranean world, while pretas are free to move about. A preta depicted during Kali Puja. Pretas are generally seen as little more than nuisances to mortals unless their longing is directed toward something vital, such as blood. However, in some traditions, pretas try to prevent others from satisfying their own desires by means of magic, illusions, or disguises. They can also turn invisible or change their faces to frighten mortals. Generally, however, pretas are seen as beings to be pitied. Thus, in some Buddhist monasteries, monks leave offerings of food, money, or flowers to them before meals. 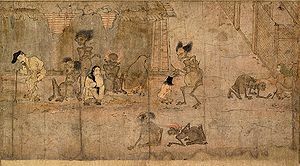 In Gaki zōshi 餓鬼草紙 "Scroll of Hungry Ghosts": a Gaki condemned to feces-eating watches a child wearing geta and holding a chūgi, c. 12th century. In Japan, preta is translated as gaki (Japanese: 餓鬼, "hungry ghost"), a borrowing from Middle Chinese ngaH kjwɨjX (Chinese: 餓鬼, "hungry ghost"). Since 657, some Japanese Buddhists have observed a special day in mid-August to remember the gaki. Through such offerings and remembrances (segaki), it is believed that the hungry ghosts may be released from their torment. In the modern Japanese language, the word gaki is often used to mean spoiled child, or brat. In Hinduism Pretas are very real beings. They are a form, a body consisting only of vāyu (air) and akaśa (aether), two of the five great elements (classical elements) which constitutes a body on Earth (others being prithvī [earth], jala [water] and agni [fire]). There are other forms as per the karma or "actions" of previous lives where a soul takes birth in humanoid bodies with the absence of one to three elements. In Hinduism an Atma or soul/spirit is bound to take rebirth after death in a body composed of five or more elements. A soul in transient mode is pure and its existence is comparable to that of a deva (god) but in the last form of physical birth. The elements except akaśa as defined is the common constituent throughout the universe and the remaining four are common to the properties of the planets, stars and afterlife places such as the underworld. This is the reason that Pretas cannot eat or drink as the rest of the three elements are missing and no digestion or physical intake is possible for them. In Thailand, pret (Thai: เปรต) are hungry ghosts of the Buddhist tradition that have become part of the Thai folklore, but are described as being abnormally tall. In Sri Lankan culture, like in other Asian cultures, people are reborn as preta (peréthaya) if they desired too much in their life where their large stomachs can never be fulfilled because they have a small mouth. ^ Mason, Walter (2010). Destination Saigon: Adventures in Vietnam. ISBN 9781459603059. Sharma, H.R. Funeral Pyres Report. Benares Hindu University 2009. Garuda Purana. J.L. Shastri/A board of scholars. Motilal Banarsidass, Delhi 1982. Garuda Purana. Ernest Wood, S.V. Subrahmanyam, 1911. Monier-Williams, Monier M. Sir. A Sanskrit-English dictionary. Delhi, India : Motilal Banarsidass Publishers, 1990. ISBN 81-208-0069-9.